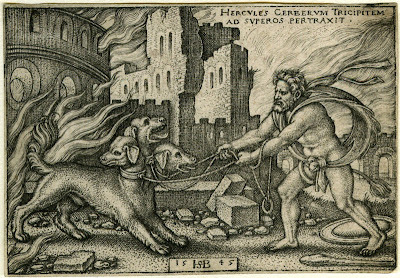 In Greek mythology, Cerberus (in Greek Κέρβερος, Kerberos, "demon of the pit") was the hound of Hades. A monstrous three-headed dog called a hellhound. Cerberus guarded the gate to Hades and ensured that spirits of the dead could enter, but none could exit (additionally, no living person was to come into Hades). Cerberus is the offspring of Echidna the she-viper and Typhon the father of hot dangerous storm winds and volcanoes; a cute couple. Orpheus used his musical skills to lull Cerberus to sleep. Awwwwwwwwwwwwww! Monkey! Hermes put him to sleep with water from the river Lethe. Cerberus was thirsty! In Roman mythology, the Sybil of Cumae lulled Cerberus to sleep with drugged honeycakes in order to permit Aeneas fuller entry to the underworld. Mmmmm honeycakes! In a Greek tale, Psyche also lulled Cerberus to sleep with drugged honeycakes. Dogs love cake! In The Inferno, Cerberus punishes the gluttons and is passed by Virgil and Dante due to Virgil throwing him a body part of one of Cerberus' victims. Cerberus hungry! It is a good piece about Cerberus/ Kerberos (or Fluffy:P).